Many people hit by the downturn will be able to defer part of their mortgage interest payments for up to two years under plans unveiled by Gordon Brown. The plan is designed to give those who lose their jobs or suffer a big cut in income extended breathing space if they are facing repossession. The scheme will cover mortgages worth up to £400,000, the BBC understands. The lender and homeowner will agree on the proportion of payment to be deferred, but it could be up to 100%. Mr Brown made the announcement during a House of Commons debate on the Queen's Speech, which took place earlier. The prime minister told MPs the eight major mortgage lenders had signed up to the plan, which will start early in the new year and is meant to cut the risk of homes being repossessed. It comes amid predictions repossession numbers could rise to 75,000 next year. Mr Brown said: "Hardworking households that experience a redundancy or significant loss of income as a result of the downturn will be able to defer a proportion of their interest payments for up to two years while they get their family finances back on track." In a separate move, he announced government-owned lenders Northern Rock and Bradford and Bingley had followed RBS's lead in agreeing that repossession proceedings would not begin in any case until households were six months behind on their payments. He urged other "responsible banks" to follow their lead. The government said it hoped the moves would not just reduce the number of homes repossessed but would reduce the widespread fear of repossession as well. BBC business editor Robert Peston said it was a "clever" scheme and "most banks will give it a go because they don't want to be seen to be turfing people out of their homes". However, he indicated some banks did not believe it would have much of an impact. The full details of the scheme have yet to emerge, but it is understood the government will underwrite interest payments, which will then have to be repaid in full at a date to be agreed with the lender. Housing minister Margaret Beckett said an estimate from the lenders involved suggested the scheme could benefit about 9,000 families. "There are probably more people fearful of their home having to be repossessed than could actually face it," she told BBC Radio 5Live. "It is that fear we want to ease." The scheme could help a two-income family where one earner has become redundant, a homeowner who has suffered a significant loss of overtime or people who have had to take a lower-paid job, Downing Street said. People could also convert a repayment mortgage into an interest-only loan to take advantage of the scheme, Mr Brown's official spokesman said. The plan is designed to boost the wider economy, with a government source describing repossession as "a small risk of something disastrous happening to you" which had a major effect on confidence. Currently, those on benefits have their mortgage interest payments covered for two years if their mortgage is below £200,000. The government's plan is effectively a government mortgage insurance scheme, which will work by the Treasury underwriting the extra risk that banks take. The banks will not need any extra capital to cover the extended risk of people defaulting on their mortgages. The theory, therefore, is that the move will not reduce the funds available for other borrowers. In the worst-case scenario, it is thought the government would be exposed to £1bn in risk, with the cost to the taxpayer likely to be about £100m, government sources suggest. Shadow chancellor George Osborne said he would not comment until he had studied the announcement, which was not in the Queen's Speech, more fully. 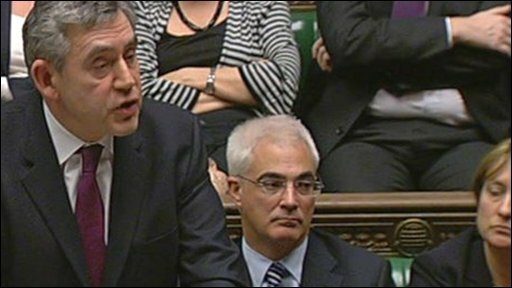 "As always with Gordon Brown, don't just look at the headline, look at the detail," he said. The Tories said later that two banks said to be committed to the plan - Lloyds TSB and HBOS - had not yet agreed to the details of the scheme. Those of us that lose our jobs won't be entitled to help with the rent, because of our hard earned savings, and those of us that keep our jobs now have to pay the mortgages of those that took the gamble to buy and lost. Lloyds TSB spokesman Stephen Pegge said the plan was "welcome" as part of range of measures to help homeowners but confirmed it had not seen the details yet. "We want to work with the government to make sure this will really work," he told Channel 4 News. An HBOS spokesman said the bank was "committed to working with customers who are experiencing financial difficulty to help them stay in their own homes" but needed to work through the detail of the initiative with ministers. Liberal Democrat treasury spokesman Vince Cable said he believed the plan would be a "positive step" in helping to slow down the repossessions process. But he warned that people must study the small print to see who would benefit and what knock-on effect the plan would have on banks' wider lending policies. The Council of Mortgage Lenders (CML) said on Wednesday that it estimated repossessions would rise sharply to 75,000 next year, as many as during the peak of the last recession in 1991. The CML believes repossessions, already rising steadily, will hit 45,000 this year. In the Queen's Speech, the government said fighting the economic downturn was its "overriding priority" for the year ahead. In a slimmed down legislative programme, it unveiled proposed legislation aimed at preventing another banking crisis and protecting depositors.